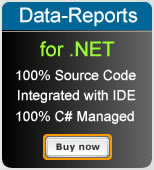 Data-Reports.NET - Generate Reports from WinFrom .NET, ASP.NET, WPF, Silverlight, C#.NET, VB.NET, Visual Studio .NET applications. Designed for WinForm, ASP.NET, Silverlight & WPF applications. 100% Integrated with Visual Studio .NET. 100% Visual Studio .NET. IDE integrated Report Designer. Powerful End-User Designer with C# / VB.NET scripting support. Bind to any DataBase, VS.NET Data components, any 3rd-party business objects or Data from any source. 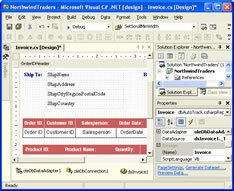 PrintViewer for WinForm, WebViewer for ASP.NET & WPFViewer for WPF. Advance capabilities to view and manage report generation. 100% C# Managed Assemblies & doesn't require any third-party DLLs. You can also purchase 100% Source code. PDF-Writer.NET component is designed to provide developers with an easy-to-use tool for creating standard PDF file from their applications. The commands provided for adding content to documents are similar to the ones available in the .NET Graphics class. This makes it very easy to use and program. Designed for Creating, Editing, Merge, Split, Fill Forms, Encryption, Digitial Sign, standard PDF file from .NET applications. Designed for both WinForm , ASP.NET , WPF , Silverlight applications. Distribution of PDF-Writer.NET component is Royalty Free. RichTextEditor.NET component is designed to provide developers with an easy-to-use, professional WYSIWYG (What You See Is What You Get) content editor for ASP.NET. RichTextEditor.NET provides an intuitive Word�-like editor which can replace any TextBox in your ASP.NET application. Even non-technical users can author and manage HTML using this component. Barcode-Writer.NET component is designed to provide developers with an easy-to-use tool for creating Barcodes from their applications. Barcode-Writer.NET class is exactly similar to .NET class, which makes design and deployment a breeze for you and your team. Designed for both WinForm and ASP.NET applications. Distribution of Barcode-Writer.NET component is Royalty Free. WebMenu.NET is an easy-to-use, professional Dynamic Menu control for ASP.NET. WebMenu.NET provides an intuitive menu system which can replace any Menu in your ASP.NET application. Even non-technical users can easily author and manage Menus using this component. Distribution of WebMenu.NET component is Royalty Free. Ajax-Controls.NET component is designed to provide developers with an easy-to-use tool to AJAX enable standard ASP.NET controls and 3rd party controls, which allow you to update page content without postback and loss of scroll position. Distribution of Ajax-Controls.NET component is Royalty Free.